Eduard Bernstein (6.1.1850-18.12.1932) was of Jewish origin and the son of a railway engine driver. He started work at sixteen in a bank where he remained for 12 years While a bank clerk he joined the German Social Democratic Workers’ Party and after leaving the bank in 1878 met both Marx and Engels in 1880 in London. From 1881-1890 he edited der Sozialdemokrat, the Social Democratic Paper in exile, living in London until he returned to Germany in 1901. He was the literary executor of Engels when the latter died in 1895. 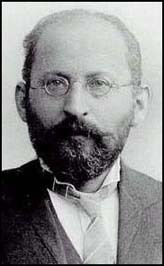 From 1896 to 1898 Bernstein wrote a number of articles in the party theoretical journal, Der Neue Zeit, attempting to “revise” Marxism and purge it of what he considered to be its dogmatic errors. He laid out his ideas in Voraussetzungen des Sozialismus and die Aufgaben der Sozialdemokratie in 1899 which was partially translated into English (about a third is missing) as Evolutionary Socialism and published in 1909. (The full text retranslated by Henry Tudor, The Preconditions for Socialism, CUP 1993.) Unusually for the time he also attacked the illiberal Prussian laws against homosexuality in two articles in Die Neue Zeit, one in 1895 and the other in 1898. He increasingly took up a Kantian philosophical position declaring that Socialism was justified ethically. He was a member of the Reichstag from 1902-1906 and 1912-1918. Although he initially voted for the war credits he voted against them in 1915, called for a negotiated peace and joined the USPD, within which, with Kautsky and Wurm, he formed the right wing of these expelled SPDers. He rejoined the SPD after the war and helped to draw up their programme in the immediate post-war period. He became a Reichstag member again in 1920 until 1928. There are a whole number of recently translated articles by him and therefore not to be found on the Marxist Internet Archive, in: Selected writings of Eduard Bernstein, 1900-1921 Humanities Press, 1996 ISBN 0391039199.